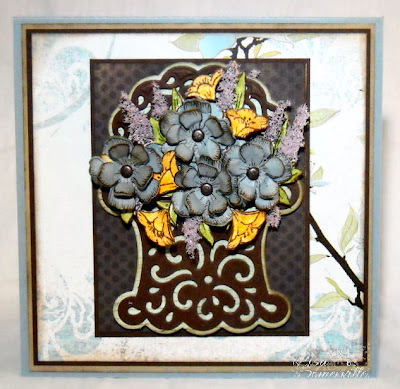 Happy Wednesday, it's new release day at Heartfelt Creations! The new Decorative Basket Collection features 5 new precut stamp sets and one exclusive Heartfelt Creations die manufactured by Spellbinders. You can arrange endless styles of flowers into these lovely baskets, they also make wonderful shower/party favors! Thanks so much for stopping by! For added inspiration and a chance to win this months release, be sure to leave a comment on the Heartfelt Creations Blog by August 16th! It's BEAUTIFUL!!! Gorgeous bouquet of flowers with lovely colors and great dimension. LOVE it! Such a beautiful card with masses of dimension. The flowers are gorgeous! Beautiful bouquet of flowers. Love the dimension to your flowers. gorgeous basket full of beautiful flowers!! I love the aged look of the blue flowers! so much dimension to your creation! The blue and yellow flowers looks so at home in fabulous basket! 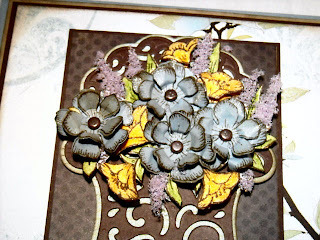 Lovely card with great texture! Enjoy the day! love the various colors you used in this basket, the flower soft ones look so real. Great creation! Love those flowers in the basket, the yellows and purple (lilac) sticking out is perfect! My goodness Lisa this turned out beautifully! You used your color sense and use of papers to the max...Love the basket image too! TFS! Gorgeous! Love the flower soft! Such a fabulous addition to this project! Now I'm going to have to go and find some! I really like the effect!! Gorgeous card, Lisa! The bouquet of flowers is so beautiful! Such a dazzling bouquet! Thanks for the heads up about a chance to win the release! Got my fingers crossed!